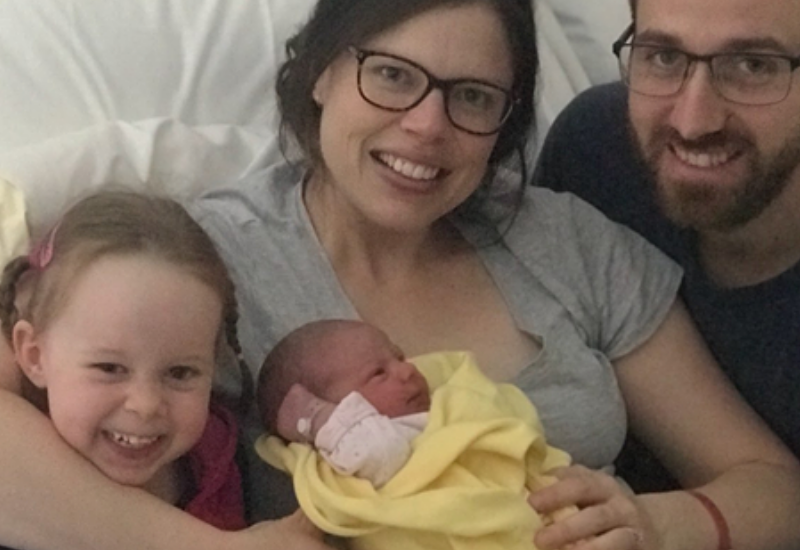 I’d read hypnobirthing stories about ladies birthing their babies in the car or carpark and wondered how that could happen – turns out when you are relaxed and in the zone, anything can happen! Tuesday 6th November (39w4d)- I woke up and started feeling a few period pain like cramps but nothing too regular so I just sat on my fitball and bounced while I binge watched some netflix series (I pretty much lived on that ball for those last few weeks!). By mid morning they were becoming a bit more regular, every 7-10 minutes or so but still not painful, just more of a niggling feeling. I called my mum and arranged for her to come and pick up our 3 year old Marlie. At this stage I hadn’t started using hypnobirthing techniques because I felt that I didn’t need to just yet. By about 2pm Spence had already put the tens machine on my back, but it didn’t seem to be helping (I used this with my first labour and it was great) it was actually making my back pain worse this time! I took it off and the back pain eased off so I didn’t use it again. Surges were between 5-7 minutes apart but then would push out to 15-16 minutes, so I used clary sage essential oil on my belly and ankles and got on the treadmill and started walking at a very low pace to try and help regulate the surges, which it did. By this stage we were playing the affirmations on repeat and every surge I would hop off the treadmill and concentrate on breathing deeply through them which was working. By 6pm surges were regular-ish between 5-7 mins apart and varying in length between 45 seconds to a minute. We called the hospital and went in at about 7.30pm to check on bubs and talk to the doctors – I was concerned that because I had tested positive for the GBS I needed to leave enough time to receive the antibiotic treatment before bubs arrived (we decided that treatment was the best option for us). The midwife put the monitor on and called our OB in. All looked fine and my OB asked if we wanted him to check dilation. I was opposed to it this time around in my preferences but at that moment I think I needed to know where I was at as this had been going all day! (just goes to show you can change your mind at any time depending on how you are feeling!) He checked and said that I was 2 cms. Because my surges were still irregular, he advised us to go home and rest/sleep. We got home at 9pm with some dinner, and Spence gave me a back and neck massage with some essential oils while I laid over the fit ball and listened to a meditation. From what I could remember of my previous labour it still didn’t seem too intense yet. It got to about 11pm and I was worried again about having enough time for the antibiotics for the GBS so Spence called the labour ward again. The midwife wanted to speak to me through a surge so after I had one on the phone she asked if this was our first baby, I said it was our second and she advised that if on our way to the hospital (we live about 25 minutes away) I feel the urge to push, pull over and call an ambulance! I still thought “I don’t feel near ready to have this baby” because I was still fairly relaxed even though the surges were getting stronger. We got to hospital at 12.05am (7/11/18 – 39w5d), and the first surge I had in the birthing suite I said to the midwife “I feel like I need to push” and she said “sometimes you feel like you need to push but you’re not ready”. I don’t remember going through transition at all, but I knew this baby was coming as I tried not to push but my body was doing it for me! With the next surge my waters broke. Another surge and I could feel bubs coming down and turning – it was so surreal to be so aware of what was happening this time! One more surge and bubs was out! Four surges/pushes! Zoe was born at 12.18am – 13 minutes after arriving at hospital! I couldn’t believe it! We had no time to get our candles out, our preferences were still in our bag, no time to get in the bath, have the antibiotics etc. I just remember asking Spence to put on the affirmations when we first got in to the suite, and a few soft words of encouragement from Spence.. that’s it! She was born crying, beautiful and pink. 6.9 pounds of gorgeous! For such a quick birth I only had a few grazes and one first degree tear, which the OB decided would heal better on it’s own. I was really concerned about tearing again so I was really relieved to hear the good news! I definately think hypnobirthing and being in tune with my breathing throughout the pushing stage contributed to this outcome. It’s been an amazing bonding experience for my husband and I to practice and prepare for the birth of our second baby (and even include our daughter in on a few things), and then be able to implement the tools and techniques to achieve a beautiful and (somewhat!) relaxed birth. I couldn’t have done it without him – he was amazing in supporting me and I’m very thankful that he was given to tools to be able to help me! 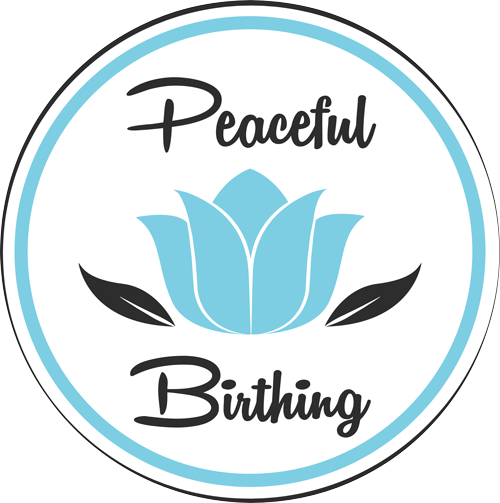 A giant THANKYOU goes to Simone from Peaceful Birthing (Hypnobirthing Australia Practitioner) for coming to us and sharing all your knowledge, information and support! Zoe Michaela Nebel was born Wednesday 7th Novemer 12.18am weighing 6lb 9oz.